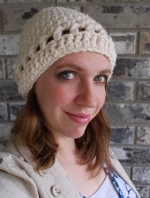 Just released, a new free pattern: Cabernet Cloche. It is, actually! He was so disappointed that it was so "normal" until I started gluing stuff on. The gauge is very loose so I probably wouldn't make it for a man to wear normally, and there's no shaping for a woman in it, but it's a good basic sweater that could be adapted several ways. He decided that the ratty straw cowboy hat "completed the look," haha! Hahah, actually, he wanted to enter the contest, but he told me he was only going to do it if he was going to WIN. I said, "I think we can manage that," and then walked off cackling a little bit. I made an exTREMEly tacky sweater for my husband to wear in the Ugly Christmas sweater contest. He walked away with the blue ribbon. I'm sharing the directions for the sweater base that I embellished, heehee. Tacky Christmas Sweater Hope you enjoy it. Merry Christmas! I've just released a pattern for a cozy boys' pullover in sizes 2-12. Come check it out! It's available both on my website and through Ravelry. Thank you guys! Well I'd love to have you, but I understand completely...sometimes I think that if I didn't have a publication to fill, I wouldn't have designed a thing for the last year! I've just posted the pattern for a semi-circular wrap done in spike stitch and I wanted to share. Water Lily Wrap I hope you like it!